The aim of the research is to present a system recently developed and used for automated cleaning of artworks and to examine the suitability of using this ultrafast and precise computed-scanning picosecond laser (1064 nm) with a repetition rate of 10 kHz and a temporal pulse length of 10 ps for the removal of soiling from leather buckles without damaging the leather substrate. Preliminary tests will be performed with the model artificially aged vegetable tanned samples to determine the leather damage threshold fluence and the soiling ablation threshold fluence before using a laser for the removal of the soiling from a historical leather buckle. As laser cleaning requires a physical parameterization for optimization of cleaning accompanied with an assessment of the morphological and chemical changes of leather, an investigations were performed to determine the leather damage and ablation threshold fluences of artificially aged and historical vegetable tanned leather using a number of analytical techniques including differential scanning calorimetry, optical microscopy, scanning electronic microscope with energy dispersive X-ray analysis, colorimetry and Fourier transform infrared spectroscopy have been used. Following optimization trials of the picosecond laser cleaning parameters on model leather samples, satisfactory removal of the soiling over the historical leather surface is achieved. The graphical abstract shows the selected metal buckels covered with leather for this study (fig. 1), the chemical composition of the soiling (Fig. 2) and laser cleaning tests for removal of soiling over the vegetable tanned leather (figs. 3 and 6). While cleaning of sensitive organic objects, such as leather, should be accomplished with much care and well-assessed technical studies, the choice of a suitable cleaning method will need many basic tests to avoid damage and accept the minimal risk. Removal of soot and soiling from the leather surface is important for future restoration and consolidation treatments . Several chemical and mechanical cleaning methods have been tested with leather to remove unwanted materials with high risk of leather damage [2, 3]. Currently, laser cleaning is considered one of the least invasive studied cleaning techniques and it has been proved more beneficial in case of sensitive organic materials. The control of laser cleaning processes has been improved due to the development of laser wavelengths and pulse widths. Reports have indicated successful cleaning of soiling from collagen artefacts using nanosecond UV/IR Nd:YAG lasers with the first harmonic (1064 nm) and fourth harmonic (266 nm) [4–6]. Past studies showed the removal of dirt over model vegetable tanned leather using high fluences (~4–7.5 J cm−2) and high number of pulses (20 pulses) of Q-Switched Nd:YAG nanosecond laser emitting at 1064 nm could induce significant side effects (such as melting and burning) of the leather substrate while successful laser cleaning of dirt on ancient leather has been performed at 3.2 J cm−2 without damaging the underlined layers . Among the most commonly used lasers which have been proposed for the successful removal of dirt is the Nd:YAG laser which is emits in the near infrared at 1064 nm and strongly absorbed by the dirt in contrast to the substrate. This wavelength provided more satisfactory cleaning results comparing to the 532, 355 and 266 nm . Recently, the development of industrial applications of laser technology offers the option of ultrashort pulse durations which used successfully to minimize thermal and mechanical side effects during laser cleaning [9–11]. The practicability and effectiveness of ultrashort picosecond lasers for cleaning artworks has demonstrated before with satisfactory and gentle cleaning results [12–14]. Leather has been used since ancient and medieval times for many purposes [13–15]. The corium is the raw material used for leather manufacturing which consists of a tight network of collagen fibres and fibrils . Animal skin has been tanned through the ages using different tannages such as vegetable tannins [17, 18]. Vegetable tanning is based on the treatment of animal skins using natural sources of condensed tannins (catechols) found in acacia, mimosa and pine, as well as hydrolysable tannins (pyrogallols) such as oak wood, gulls and sumac leaves [1, 16–19]. Animal skin collagen protein interacts with the large molecules in vegetable tannins which transform the skin into leather with greater stability and resistance to microbial attack, comparing to non-treated skins . The accumulation of dust and soot particles on the leather surface can be a serious problem for leather conservation since dust particles are abrasive and can be difficult to remove from the irregular surfaces. These accumulated particles accelerate leather deterioration through promoting microbial growth and the absorption of moisture from the surrounding environment . Also, vegetable tannins can deteriorate due to exposure to UV radiation as vegetable tannins are strongly absorbing between 270 and 350 nm . Oxidation, combined with the effects of atmospheric pollution, can also lead to acidification and darkening of the leather surface . Presence of pollution gases, which could be transformed into acids by the reaction with moisture, can oxidise the lubricating agent and dressing layers on the leather surface and among the collagen fibres leading to the darkening of leather surface. Furthermore, acidification causes leather decomposition, which will be manifested in a grain layer which appears powdery . The aim of the research is to present a system recently developed and used for automated cleaning of artworks and to examine the suitability of using this ultrafast and precise computed-scanning picosecond laser (1064 nm) with a repetition rate of 10 kHz and a temporal pulse length of 10 ps for the removal of soiling from leather buckles without damaging the leather substrate. Preliminary tests will be performed with the model samples to determine the leather damage threshold fluence and the soiling ablation threshold fluence before using a laser for the removal of the soiling from a historical leather buckle. A number of historical buckles (approximately ca. 100 years old, from the original head office of Stanley and Sons founded in 1856, and displayed at Ripley’s Museum, London, UK, see Fig. 1a–d) have been subject to this study. 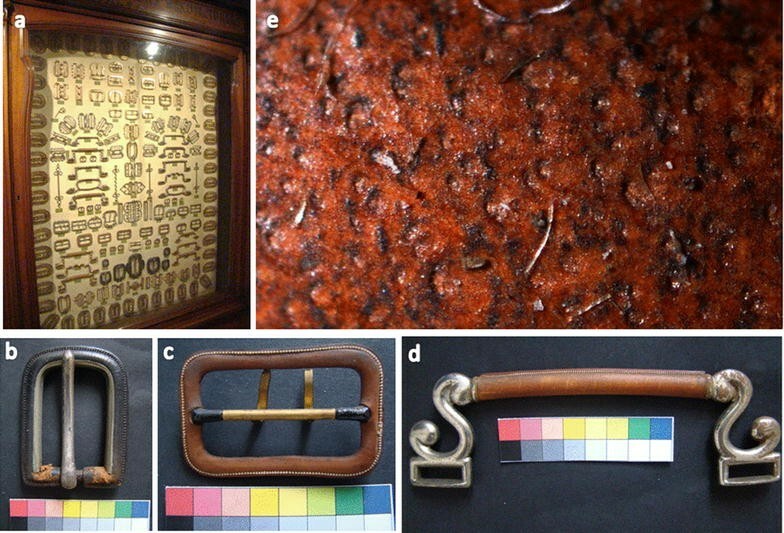 The historical metal buckles contain leather covered with accumulated dust/soot (see Fig. 1e) which have darkened the leather as well as altered the appearance of the objects during display. Leather shows reduction in the strength, which may be as result of chemical damage by pollutants or by the corrosion of the buckles metal parts. As part of the research, new vegetable-tanned (condensed tannins: mimosa) calf leather was produced (in one of tanneries of Old Cairo, Egypt) with a close similarity to the manufacturing technology to the historical leather buckles and this leather was used to prepare the test samples used for preliminary stages of this study. The model vegetable tanned leather samples were covered with artificial standard dust (ASHREA 52/76) supplied by the (Particle Technology Ltd, UK). A thin layer of the dust was applied over the model leather samples using a dry soft brush. Model vegetable tanned leather was exposed to thermo-oxidative ageing. Heat ageing of the leather will allow a loss of moisture, reducing the flexibility, change as well as the dimensions of the leather and alter the colour. Artificial ageing is expected to produce deterioration similar in historical leather and tt is an absolute necessity to evaluate the effect of conservation treatments. The model samples were undergone dry thermal ageing in a standard laboratory oven with a dry heat at 100 °C for 11 days, at which point the leather weight is constant [1, 23, 24]. Laser cleaning tests were performed using the High Q custom Nd:Van regenerative amplifier picosecond laser with a repetition rate of 10 kHz with output wavelength of 1064 nm and a temporal pulse length of 10 ps (FWHM). The picosecond laser tests were carried out using (see Table 1) scanning laser with fluences below previously determined damage threshold flunces and regulated between 1 and 3.18 J cm−2, with power output 100 mW; number of scans 1–10, traverse speed 300–825 mm s−1; laser spot size: 30 μm (constant); Hatch spacing: 0.03 mm (constant) and 10 kHz repetition rate. The lasers were clamped at a fixed position above the sample, which was mounted on motorized A3-axis motion control system (Aerotech) in conjunction with NView MMI software to manipulate samples, calculate laser parameters and select the size of scanning area with automatic distance detection and adjustment of the laser focus for uniform cleaning. The experimental set up of the ultrafast laser systems employed here has been reported for conservation purposes elsewhere  where femtosconed and picosconed lasers were employed successfully to clean painted objects and ancient papyrus [26, 27]. Optical microscopy (Leica, UK) and scanning electron microscopy were employed to study the morphology of the leather surface and assess the laser cleaning. Microscopic investigations were carried out using an Environmental Scanning Electron Microscope (FEI Quanta 200, Netherlands, with accelerating voltage 30 kV). For the elemental analysis of the deterioration products and assessment of laser tests, Scanning Electron Microscope (Carl Zeiss Ultra Plus Field Emission) connected with an energy dispersive X-ray spectroscopy (EDS) detector (Oxford Instruments X-Max) was employed. The instrument is associated with an ultra high-resolution secondary and backscatter electron imaging (1 nm), utilising new in-lens detector technology, and a charge compensation system for the imaging of non-conducting samples. Identification of the tanning material of the historical leather is needed to understand the manufacture technology of the leather as well as the interaction of the laser radiation and tanned leather. The Ferric Spot Test [23, 28] was used to determine the type of tannin (vegetable or not) using fibres from the historical leather samples. The fibres samples were wetted with distilled water and soaked in (2 % w/v ferric chloride and water, FeCl3·7H2O). Positive result for the presence of vegetable tannins is indicated by dark colouring of the fibres. The Vanillin spot test for the testing the presence of condensed tannins was carried out using leather fibres samples (4 % vanillin in 99 % ethanol, and the hydrochloric acid HCl). The presence of a red colour is an indication of the presence of condensed tannin. The Rhodanine spot test for testing the hydrolysable tannins was employed using leather fibres samples, 2 N H2SO4, Rhodanine (0.667 % w/v in 99 % ethanol) and 0.5 N potassium hydroxide (KOH). A red colour yields a positive reaction. The denaturation temperature (Td) is a measure of the physiochemical change of the collagen structure within the leather causing disruption of the structure (e.g. by heat or radiation or solvents used for cleaning). Analysis of the denaturation temperature provides information with regards to the temperature at which the collagen triple helix in the leather collapses and is transformed into a random coil. Differential scanning calorimetry (DSC) was applied as a thermoanalytical technique to investigate the hydrothermal stability of the leather and measure the denaturation temperature of the model leather samples (fresh/aged/laser irradiated) [29, 30] as a function of the various conditions to evaluate laser cleaning. This will help assessment of the laser cleaning of the model leather samples because any damage or breakdown of the collagen network should decrease the denaturation temperature . A reduction in the denaturation temperatures is an indicator of the degradation of the triple helix of the collagen molecule. However, various factors such as the type and age of animal skin, tanning material and water content can affect the leather Td [31, 32]. Td measurements were carried out using a Mettler Toledo DSC822e calorimeter. The model leather samples (~10 mg) were placed in a conditioning room at 20 °C and 60 % relative humidity for a minimum 48 h before measuring Td. The leather samples were hermetically sealed in aluminum pans (40 µl Al pans withstand pressure of up to 0.2 MPa and temperature of up to 640 °C. The crucibles were sealed with a sealing press with a sealer plate and plunger set for standared crucibles. The selected temperature range was 0–140 °C and the heating rate was 5 °C min−1. During heating the fibers will start to shrink at a certain temperature, depend on the stability of the collagen. The DSC was previously calibrated using “Check ʌexo In or ʌexo Zinc” method with Indium/Zinc calibration pans. The samples (fresh/aged/aged-laser irradiated model vegetable tanned samples, used in Td measurements) have been employed to measure the moisture content of the leather which was determined by weighting before and after drying in a laboratory oven (Abinghurst LTd, UK) at 100 °C for 24 h or until a constant weight was achieved. The weighting of the samples was carried out using (A&D balance, USA, readability to 0.001 mg). Measuring the moisture content of leather could be an indicator for assessment of the thermal effect of laser cleaning of leather. Fourier transform infrared spectroscopy (FTIR) was carried out using a Thermo Nicolet iS10 FT-IR Spectrometer in reflectance mode using an attenuated total reflectance (ATR) slide-on accessory with diamond crystal, spectral range 4000–400 cm−1 and resolution 4 cm−1, to attempt and elucidate the composition of soiling on the surface. Spectrodensitometer (X-Rite, Incorporated, 500 Series, Germany) was employed to measure the colour changes of the different leather conditions of model leather (new, aged, soiled and laser cleaned) based on changes observed on the L scale (Luminosity), a* scale (red/green) and b* scale (yellow/blue). Seven measurements were averaged to obtain one data point. Microscopic investigation and qualitative chemical spot tests of the historical leather buckle indicates that the buckles leather of vegetable tanned leather using condensed tannins . Vegetable tannins may have different chemical structures, but share some common properties as being insoluble in organic liquids, miscible with water, and being hygroscopic, amorphous substances, which are sensitive to oxidation and reduction . FTIR spectra of fresh and aged leather show standard collagen peaks including a small band at 1377 cm−1 which is more evident in aged leather and could be related to the accumulation of an unidentified degradation product in the leather. Leather samples contain spectra typical of leather (collagen) with Amide-I (1634 cm−1) and Amide-II (1535 cm−1) bands. FTIR analysis of the soiling on the historical leather indicates the presence peaks ascribed to calcium carbonate at 878 and 1422 cm−1 and clay minerals at 795 and 1012 cm−1 (see Fig. 2a; Table 2). Furthermore, the elemental analysis of the soiling on the buckles leathers using EDS analysis indicates the high presence of soot and dirt elements such as Carbon, Sulphur, Silica, Calcium, Chlorine, Aluminium, Sodium and Iron might be as a form of sodium aluminium silicates, gypsum and calcium carbonate (see Fig. 2b; Table 2). A series of laser cleaning tests and cleaning assessment procedures were carried out to determine the damage threshold fluence (F dam) of the leather substrate and the ablation threshold fluence (F abl) of the soiling. For the successful employment of the laser, the ablation threshold fluence of the soiling must be lower than the damage threshold fluence of the leather . 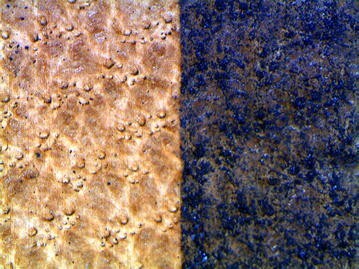 Modifications of laser cleaning parameters (such as number of scans and fluence) were carried out to optimize the laser parameters for satisfactory and homogenous removal of the soiling from the model leather samples and the historical leather without inducing alterations to the leather surface (such as melting, burning, ablation) or physical properties (denaturation temperature and water content). A preliminarily study with the artificially aged soiled leather samples assisted the understanding the damage features of leather (burning, melting and ablation) after laser irradiation with a fluence higher than the damage threshold fluence . The microscopic investigation showed that the model aged vegetable tanned leather with no soiling could be irradiated and scanned safely with a fluence of 3 J cm−2 using 3 scans without inducing damage of the leather surface.. As shown by DSC measurements (Table 2) of the model leather samples (reference 109 °C/aged 82 °C), there were a large reduction (25 %) of the denaturation temperature after thermal ageing but no change was recoreded after laser cleaning at the damage threshold fluence (3 J cm−2) using 3 scans. While measurements of the moisture content indicated that the non-aged reference leather sample has a moisture content of 12 % w/w, which is the normal content , there was a slight change in the moisture content of the model leather after aging (10 %) maybe due to the thermal ageing. However, laser irradiation of the model aged leather at the fluence of the damage threshold (3 J cm−2 using 3) induced a slight change of the moisture content (9 %) of the model aged leather maybe due to the thermal effect of laser. The microscopic investigations indicate that the ablation threshold fluence of the soiling is lower than the damage threshold fluence of the leather. The artificial soiling could be removed safely from the model leather samples at a fluence of 1.02 J cm−2 using 5 scans (see Figs. 3d, 5 right). For complete removal of the soiling particles, it was necessary to increasing the number of scans up to 5 scans where two scans and four scans showed non complete removal of soiling (see Fig. 3). The picosecond laser cleaning system showed a selective, localized and precise cleaning (see Fig. 4). However, melting of the leather was detected at 8 scans (see Fig. 5, left). Colorimetric measurements of the model leather samples indicated that after the thermal aging leather is severely darkened by reduction of the surface luminosity (L*), and an increasing of the redness and yellowing has been recorded by increasing the values a* and b*. While aged soiled leather shown an expected reduction of the luminosity and the other values (see Table 3). The colorimetric measurements of the leather surface after removal of the artificial soiling, at a fluence of 1.02 J cm−2 using 5 scans, showed increasing of the leather luminosity with mostly similar colorimetric values (L 49.16, a* 23.11, b* 27.22) of the aged leather with no increasing of the yellowing or redness of the leather. 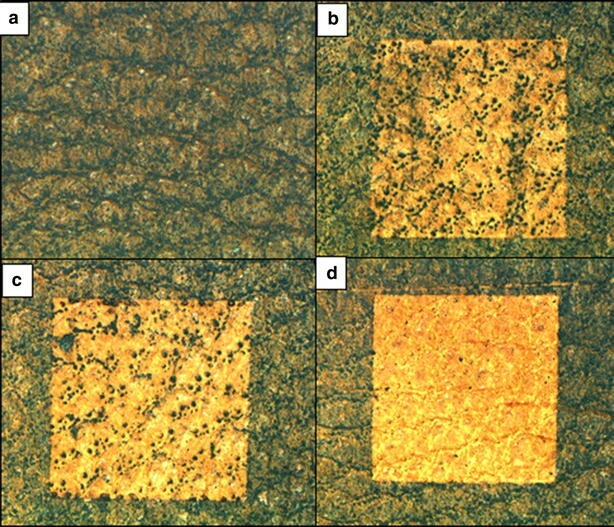 Upon an extensive optimization and analysis on model vegetable tanned samples, Microscopic investigation of laser tests with the historical leather in the buckles showed that the soiling particles could be removed satisfactory without damaging the leather using the commonly used laser wavelength 1064 nm  at fluence of 2 J cm−2 using 3 scans(Fig. 6, right). At this fluence, one scan was not sufficient for the complete removal of the soiling (Fig. 6, left). Increasing the number of scans provides better cleaning results but if the number of scans is higher than 5; damage of the leather (denaturation) may occur. This study aimed to investigate the feasibility of using ultrafast scanning picosecond laser (1064 nm) for, safely and controllably, the removal of soiling from leather buckles without damaging the leather substrate. After optimization of laser cleaning parameters on model samples and, determination of damage threshold of aged model vegetable tanned leather and the ablation threshold of the soiling layer over the archaeological leather have been assessed. Successful removal of the soiling over historical leather has been carried out with picosecond laser emitting at 1064 nm with fluence no greater than 2 J cm−2 and 3 scans. The leather cleaning was assessed using optical and scanning electron microscopy, differential scanning calorimetry (DSC) and measurements of the moisture content. The satisfactory results and advantages of the using ultrafast ps scanning laser for cleaning of cultural heritage materials support the ingoing efforts for developing new portable industrial picosecond systems for conservation needs. The availability of new commercial mobile picosecond systems, with more repetitions, will provide conservators with faster and gentle homogenous cleaning comparing to the nanosecond pulsed lasers. AE developed and coordinated the work and access to the objects. AE, PF and KW performed the laser cleaning tests with the ps laser system. AL and YF assisted in tanning identification, DSC analysis and moisture content measurements. All co-authors contributed to the writing of the manuscript and results interpretations. All authors read and approved the final manuscript. Batishche S, Kouzmouk A, Tatur H, Gorovets T, Pilipenka U, Ukhau V. and Kautek W. Simultaneous UV-IR Nd:YAG laser cleaning of leather artifacts. In: Lasers in the Conservation of Artworks, LACONA VI Proceedings, Vienna; 2005, pp. 21–2. doi:10.1007/978-3-540-72310-7_26.